The president of the Academy in this period was Lewis C. Walker, an able and faithful administrator. The vice president was Charles Dickinson, younger brother of Albert and Melissa, whose bequests were to help the Academy's financial fortunes so greatly. The secretary was Nathan Davis III, grandson of the original Academy president. Charles Dickinson, like his brother, Albert, was a great philanthropist and also a supporter of early aviation. He was known at all the infant flying fields around Chicago, which he visited in a taxi. Extremely generous to young pilots down on their luck, he also in 1926 financed the first air mail effort, a line between Chicago and Minneapolis. Henry S. Henschen, Eugene H. Garnett, Lloyd A. Laflin, Carroll Sudler, Sr., and Paul Steinbrecher were board members, while such prominent scientists as Orpheus M. Shantz, Henry J. Cox and Prof. Henry C. Cowles were scientific governors. The latter is often called the "father of North American ecology" for his pioneering work in the Indiana Dunes, though the title might go equally well to Dr. F. C. Clements of Nebraska. Dr. Cowles ultimately became president. A notable Bulletin publication of the period was Dr. Herman Pepoon's Flora of the Chicago Region. WILLIAM BUSHNELL STOUT REMEMBERS THE EARLY DAYS In 1912, the Illinois Aero Club promoted a Chicago flying meet with Harold McCormick of the Harvester family and Charles Dickinson of the seed-company fortune as reputed chief backers. The affair was well publicized. Fliers from all over the world were expected to compete for prizes. The scene was to be Grant Park, on the lake front. The park was plenty big, as anyone would know---for it was almost a mile long at that time. There were dozens of pilots at the meet, and several fatalities. On one of the first days, Wagner, the Tribune photographer, took some of the first photographs ever taken from the air, riding in the passenger seat of Andy Drew's B-Wright. Lincoln Beachey broke the world's altitude record with a Curtiss ship---something about 12,000 feet, as I remember---and at this meet real history was made. In 1913, the year after the Chicago air meet, Harold McCormick financed an airport for the Illinois Aero Club out in Cicero, at the end of the elevated line, where a number of experimenters were working. 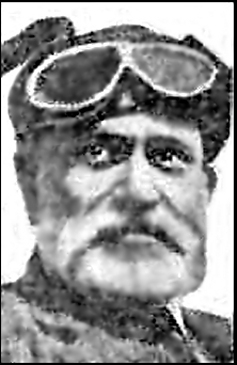 Grover Sexton, a local newspaper air enthusiast---with the financial help of some unknown "angel"--- was building a large enclosed-fuselage monoplane with a big two-cycle engine, which later was dubbed "The House Movers' Despair." It never flew or even taxied. Mustachioed Chance Vought was on the field building his "umbrella" plane---so called because the wing was circular and braced like an umbrella, but with wires on the top as well as the bottom of the circle. It was fitted with a Gnome rotary engine brought over from France---the first of the successful air-cooled airplane engines. After the Chicago lake-front air meet, a French designer and pilot, Louis Paulhan, came over with a Farman biplane fitted with a rotating Gnome engine, and flew exhibitions around the country. Later this machine was purchased by a pilot named Otto Brodie, and brought to Cicero, where he gave lessons and flew exhibitions. The center of all flying was Cicero Field. My many visits to Cicero meant much to my education, and I met men who were to be the mainstay of the next phase of flying. Still, I had not flown. When Brodie bought the Farman, I had my chance. With the possibilities of publicity in mind, he asked one day if I wanted a ride. My wife was sitting outside the field waiting for me. She was once more expecting a baby. I went out and asked her if it would be all right. I can look back and feelwhat went through her mind, but she showed no hesitation. "It is a part of your business, dear," she said, with all seriousness, "and if you think that it is worth the risk, I'll take mine." We made the flight aroud the field at an altitude of 200 feet---the ceiling of the plane was about 400---and came down safely. From William Bushnell Stout's book, SO AWAY I WENT! July 27---(By Associated Press.) 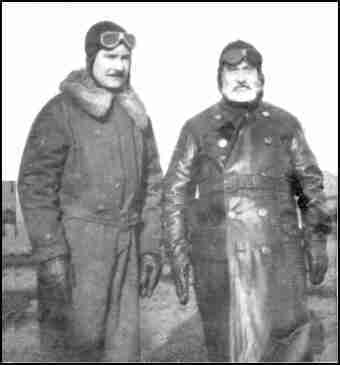 ---Eddie Stinson, accompanied by Charles Dickinson, president of the Aero Club of Illinois, and Arthur Gray, mechanic, arrived at Hazelhurst Field at 7:30 o'clock (eastern standard time) this morning in the Junker all-metal monoplane in which they left Chicago at 11 o'clock last night, completing in 8 1/2 hours the first non-stop three passenger night flight between the two cities. via email from John Miller, 5-8-08 Charles Dickinson was granted C.A.M. 9 from Chicago to Minneapolis on June 7, 1926. Due to bad weather on the first fligfhts on this route on June 7, and the death of Partridge, caused the route to be shut down on the evening of the first day. It was not resumed until the 1st of October, 1926. Charles Dickinson Charles Dickinson, 68-year-old mail contractor, who flew his own plane between Chicago and St. Paul, when his fliers struck for better planes recently. ONLINE RESOURCES If you search for "Charles Dickinson" +aviation, using the Google search engine, (1-13-04), you will find about 1070 links. If time permits, you can visit many of these and find little bits and pieces of his story. Perhaps among the most helpful are the following. CHARLES DICKINSON ON THE AeroFiles WEBSITE You will find an entry for Charles, on this website which includes photos and descriptions of three of his planes. You can visit the site by clicking the title. You may want to use the "Find" function of your computer on "Dickinson"to locate the entry on the page. the Start of Air Mail This story on the Century of Flight website mentions Charles Dickinson, if only briefly. You can access the page by clicking on the title. Dickinson appears to have died in 1935.